Hi Joan, Glad you enjoyed the post. Street plating really makes an area looked so much more loved and friendly. Great post. 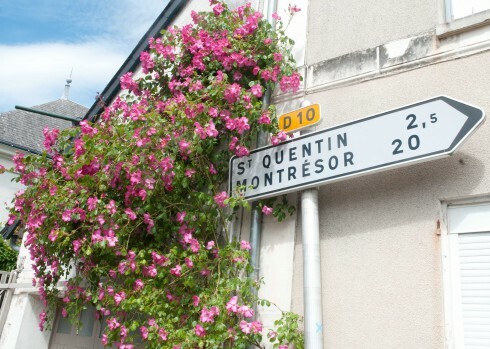 What a lovely idea filling streets with roses and hollyhocks. Hi Chloris, yes, streets looking very floriferous at this time of the year and then we’ll plant bulbs in autumn for some spring colour too. Gorgeous and what a difference plants make to pavements in urban areas. We are increasing our display here whilst keeping a beady eye out for the sprayers. Hi Sue, yes, these plants really brighten up our streets. We haven’t had problems with the council mistakenly chopping anything for a couple of years now and they encourage the greening of the area, so long may that continue! I suspect that our local councils are far too afraid of being sued to allow roses anywhere near public footpaths. Hollyhock seeding tree pits would be a great idea, though. They’re good at surviving in dry and thankless conditions – perfect. Hi Diana, I was thinking more of planting roses in our front gardens as most have a patch of earth and continuing to plant up tree pits with Hollyhocks-they are so brilliant and drought tolerant. Hi Rachel, lovely to hear that lots of other cities are greening up areas. Flowers near the motorway can only be a good thing! Hi Julia, Hollyhocks are quite promiscuous, but I should imagine your red hollyhock came from the plant a little further down the street. Having said that, wouldn’t it be great to collect the seeds from the yellow hollyhock, plant up a whole field of them and see what the results were. Know anyone with a spare field? Love this idea, there are patches everywhere as one starts to look… I think your bnb link is missing a w in the adress. Hi Louise, thanks for noticing faulty bnb link-now updated! some lovelyideas.No luck with hollyhock seed butinspired to try again. LadbrokeGrove is quitefloriferous from Elgin Crescent to HollandPark Ave,. The corner of our garden square on Ladbroke Grove has rambling rector really rambling folowed by solanum crispum album, which I shall also try on the shady south east corner.Our hedge that side is a cotoneaster which is better than privet. Hi Susan, I think Jean-Loup must be an excellent sprinkler of hollyhock seeds. Most of ours are started in pots in autumn and then planted out as plugs or small plants in spring. Always worth another try! 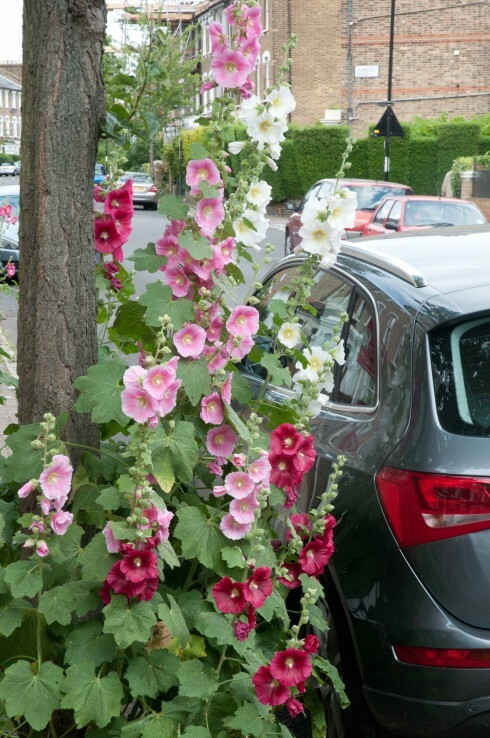 Lovely pics of our little rue Ambler and its so English hollyhocks by the trees, many thanks, food for the soul for sure and the people walking by just love them too. I think that the front garden rose idea is an excellent one and really not that hard to get going or to look after. We’ll talk. Yr pics of the French roses and villages in the Spring took us back to our fortnight this year in the Correze and Dordogne where the roses (climbers in particular) in May and early June were just breathtaking and everywhere too: public squares, people’s gardens, fences, up on old brick walls, you name it. Let’s try and look for some real French varieties too, if we do your rose scheme, pierre de ronsard, in particular. Thanks again. 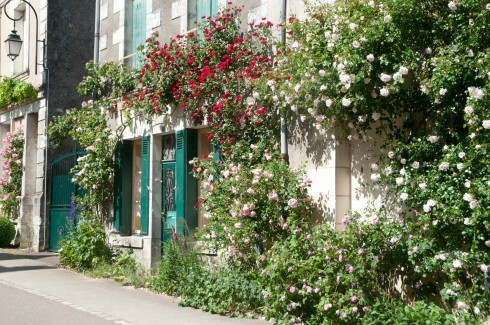 Hi Robert, yes, roses were everywhere in France in June and what a delight! 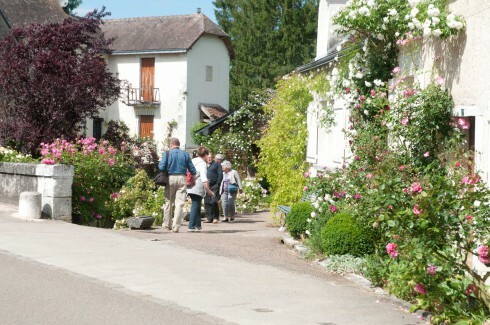 We also went to Chateau du Rivau in the Loire, as well as Chedigny, with over 450 fragrant roses on show. Have started making a list……. What marvellous ideas for greening up otherwise dull urban streets. I’m delighted to have found your website, good luck with translating the concept in Finsbury Park. Thanks Kate. Think this project may take some organising, but it would be wonderful to get it started this autumn…..we’ll see! 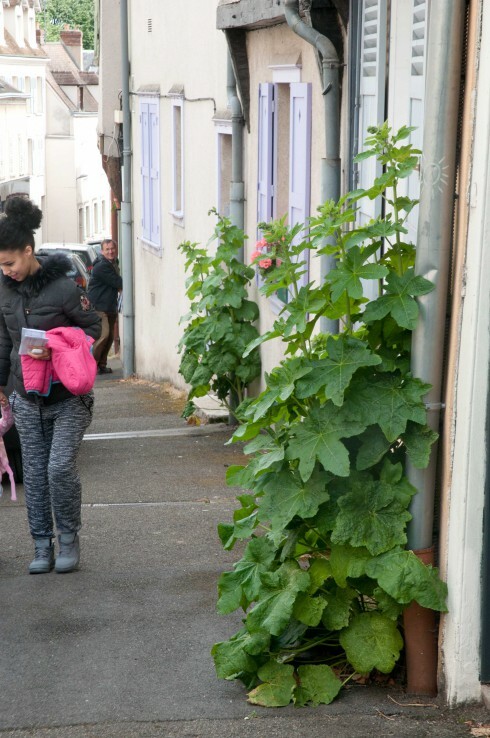 The hollyhocks and roses are a wonderful addition to street ‘furniture’ and your first pictures immediately reminded me of a holiday in France (Île de Ré) where every house seem to have hollyhocks growing along the base of their walls (often not even in obvious soil). Hi Alison,Yes, hollyhocks are amazing plants. Must have a very long tap root. Jean-Loup’s seems to be growing out of concrete too! Love seeing these by the coast in Norfolk along with other seaside favourites such as valerian and sisyrinchium, which makes me think that we could get planting some of these hardy plants in tree pits too. One again I have enjoyed your page, it’s becoming like a friend dropping in on my day so thank you very much. I love the idea of dropping hollyhock seeds in random places, I think the naughty side of me is going to be doing it this autumn, proof that I really, really do need to get out more! Hi Cheryl, I think in many gardeners, there is a hint of the obsessive and I too have collected hollyhock seeds when on holiday (most often at the seaside) and then spread the seed elsewhere. 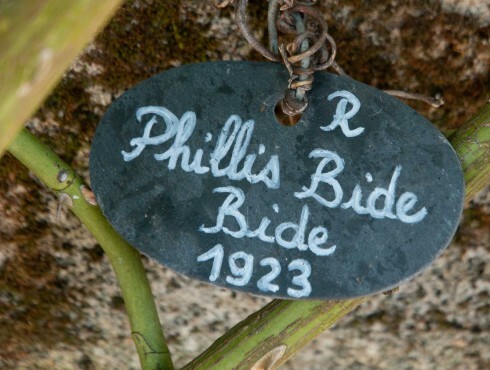 Stayed in a dingy house in France one year and sprinkled above seeds (which were still hanging out in the car) in the front gravel which was devoid of plant life-do wonder if they ever got the chance to come to fruition…. Hi Lynn, We generally have a good relationship with our Council, but on the odd occasion, an over zealous street cleaner has cleared a whole tree pit (or two) of it’s herbaceous content. However, I think the more planting there is, the more it looks like it was meant to be there and the less likely to be removed. Always worth speaking to your local greenspace department if it keeps on happening. They may even help with a bit of funding…. Really nice! I agree, plants and grass make such a difference and can create a warm atmosphere. 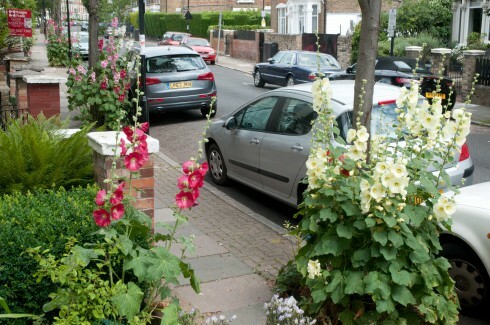 Hi Max, street planting and floriferous front gardens can really transform an area for residents and passers-by alike. More tree pit planting planned for next year for an even friendlier neighbourhood…. 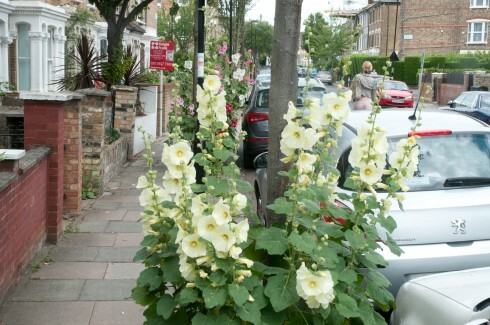 I adore hollyhocks too, and it really is surprising how such large plants take hold in tiny cracks in the pavement. 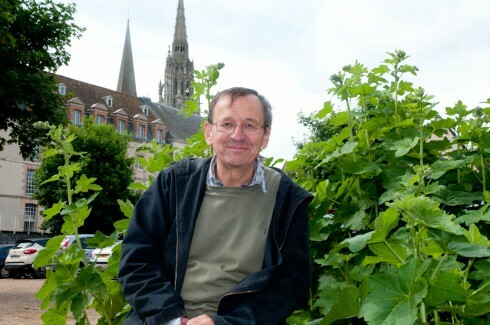 Vive Jean-Loup! Your street looks lovely too. Looking forward to hearing about the other French gardens.